What does Modi-Netanyahu ‘chemistry’ mean for Indian Jews? Home Opinion What does Modi-Netanyahu ‘chemistry’ mean for Indian Jews? 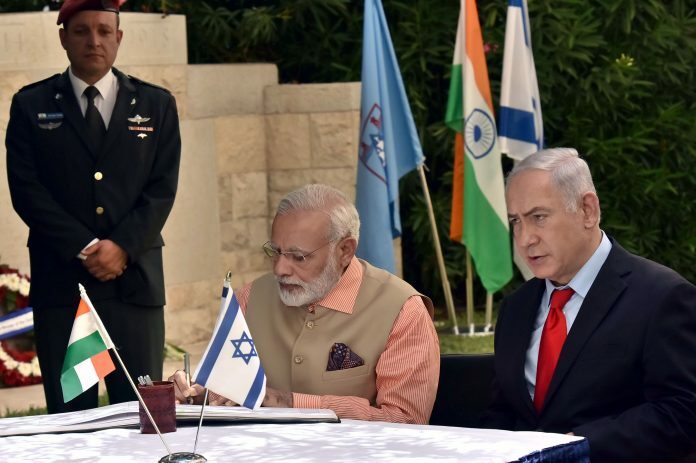 Meetings between the PMs may not make much difference to Israeli travellers to India, but for Indian Jews settled in Israel, they provide important optics. As we approached Israeli Prime Minister Benjamin Netanyahu’s visit to India Sunday, national dailies reminded us about India and Israel “celebrating 25 years of friendship”, and how Israeli tech in drip-irrigation and soil-water management will alleviate water-stressed farmers in Karnataka, Maharashtra and Gujarat. As I read these articles celebrating Israel’s agricultural miracles and its prowess in defence systems, two images floated in my mind. First, of Betzalel Eliyahu, an Israeli award-winning agriculturist and Pravasi Bharatiya award-winner I interviewed in the arid Negev region of Israel a few years ago. Eliyahu is a Kerala Jew. The second is the image of Yigal, in his IDF uniform, smiling from a photo hung in a municipal memorial for fallen soldiers in Dimona, a depressed municipal town in southern Israel. Yigal was born to Indian parents, and died in Israel’s war of 1982. Yigal’s mother, who I met in Dimona, is fluent in Marathi. They are Bene Israel Jews, the largest Indian Jewish community, whose history has been traced back 2,000 years by their historian Hayim Samuel Kehimkar (1830-1909). I searched extensively for first-generation Indian Jews, men and women from the three major Jewish communities – Bene Israel, Cochini and Baghdadi – who had long lived in social silos, hardly ever inter-marrying. They migrated to Israel as adults, young families or accompanying children. From over 125 detailed ethnographies collected in 30 towns across Israel, I uncovered how after Israel’s establishment (1948), the Jewish Agency sent emissaries to synagogues across India targeting potential Indian Jews, offering instant citizenship, educational, medical and housing benefits to all who would make ‘aliya’ (a Hebrew word, denoting ascent for a Jew who migrates to Israel). With no history of antisemitism in India, Jewish out-migration was slow, mostly over the 1960s. Some were attracted by the prospects of a fuller Jewish life; others by the pecuniary benefits; some who were displaced from Karachi to India during Partition craved for a settled home in Israel. However, post-migration narratives recounted the painful shock of Indian Jews encountering widespread negative stereotyping in Israel – of being ‘dark’, ‘uneducated’ and from a ‘poor’ country. Hundreds of Indian families were sent to the Israeli ‘periphery’, to build-up infrastructure. Since state-controlled apparatus designated spaces, Benyamin was not alone. Dimona, Yarukham, Kiryat Shmona, and Kiryat Ata remain ‘development towns’. They never took off, nor did the lives of many first-generation Indian Jews. In 1964, Bene Israel mobilised street protests against discrimination and appealed to Nehru, which led the Israeli Knesset to take cognisance. “Individual stories of first-generation success were few,” confirmed Dr Lael Best, cardiothoracic surgeon, Rambam Medical Center, Haifa, and Pravasi Bharatiya awardee (2017). Today, this ageing first-generation of Indian-Israelis has proudly mobilised projects for Indian Jewish heritage. The next generation continues to incorporate curry and ‘bhaaji’ into Israeli cuisine. Bene Israel continue to perform ‘Malida’ and ‘Henna’ ceremonies, as they did in India. Bollywood dance groups abound in Ashdod, Ramla and Lod. Indian TV soaps with Hebrew subtitles are widely viewed. The Indian ambassador is invited to grace major community events. 15 August and 26 January celebrations at the Indian Embassy Residence in Herzilya attract large multi-generational crowds of Indian Jews. Parallel to this story are the journeys of over 40,000 Israeli visitors to India. Of these, a majority are young men and women, recently discharged from Israel’s mandatory military service. They traverse through India along mountain treks or beaches in Goa, sometimes without a fixed itinerary. Favorite ‘Israeli’ haunts are validated through Hebrew blogs and word of mouth. “My friends will spend all our IDF allowance on this trip, so we find low-cost hostels and eat in small joints. India is so peaceful,” said Ronit, whom I met in Hampi, Karnataka. For many, it is a rite of passage for others just a “lifting of the weight of three years” to decompress before returning to enter the job market back home. My fieldwork in Hampi, and the crowded main bazaar in Paharganj, Delhi, revealed cafes with Hebrew menus, offering falafel and shakshuka, reminding me of tiny cafes in Jaffa, Israel! Unfortunately, despite extended travels through India, Israeli youth interact mostly with tourist facilitators and hostel owners. Unlike Israeli business travellers who engage with Indian tech-professionals or entrepreneurs, youth travellers rarely meet university students, engineers or lawyers in-the -making, who would be their intellectual counterparts. I wonder how their perceptions of India as ‘exotic’, ‘peaceful’ and ‘poorly developed’ might become more nuanced with some wide-ranging social exposure. While Israeli tourists may be apathetic about the Modi-Netanyahu ‘chemistry’, or defence collaborations, for the Indian Jewish diaspora, Modi-Netanyahu visits are important optics of validation, and of an India-Israel story which they set in motion decades ago.